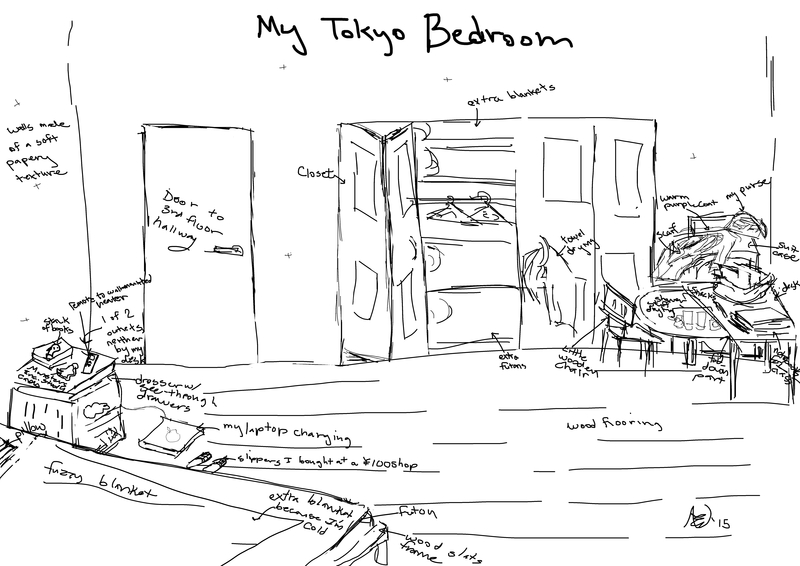 My Tokyo Bedroom: A Travel Blog – Protagonized. I was feeling homesick for Japan, so I decided to show you more of the room I stayed in during February. I spent a lot of time in this room. In other news, grad school decisions are closing in. I was accepted into one in San Francisco, but I’m considering turning it down and applying to attend an English-speaking grad school in Japan in a few years instead (I’d love to attend one in Japanese, but I can’t even make light conversation in Japanese, much less take grad school classes in it). It’s getting increasingly obvious to me that I want to live in Japan for a longer period of time: long enough to get a job and pay rent. Grad school would be a great way to get established over there. These types of drawings are fun. Maybe I’ll do more of them.